Here at HANIF FURNITURE Shop Display , you will find the store solutions for all of your business and industry needs. We have been serving our customers with the best shopfitting productions available since 1985. We pride ourselves in offering the finest quality store solutions around, as well as providing added value with our design-build capabilities and after-the-sale support services. As manufacturer, we located in Pakistan, Karachi City. 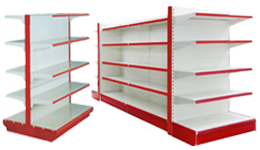 We are specialist manufacturer of wide range of Shelving, Racking, Shop Equipment, Store Fixture & Accessories. Whatever your business, we can help you find the right way to market your goods and services. Wall unit, and wall mounted shelving. Use for exhibition,shops,departmental store and etc. Find the perfect wood shoacase at Hanif Furniture. Huge variety of glass counters. These Racks are available in different sizes and specifications. Strong light weight shopping trolley on wheels. Cash Counters offered by us are available in different designs and specifications. Find the perfect display showcase at Hanif Furniture. Our range of shopfitting products includes wall display case. Gondola shelving is ideal for showcasing products in grocery stores, and convenience stores. Gondola provides better display in beauty products supply and several retail locations. This shelving is available in different colors, height and sizes. This display shelving comes in various colors, but the most general is off white. This gondola comprises of 4 racks to display items on it. gondolas have been the classic steel shelving workhorse of the retail industry. Over fifty years of experience manufacturing gondolas, we can provide you with the quality products and excellent customer service that you deserve.Our gondolas are built to exceed industry standards, as is our warehouse storage shelving and other commercial shelving. We enjoy a broad client base - from retailers to brand owners and from designers to shop fitting contractors. Our rang of quality counter showcase and display cabinets are ideal for retail store display and trade show. 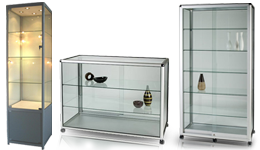 Glass fronted showcase are ideal for retail display, exhibition counter and museums. They come pre assembeled and ready to go. Good service and high quality can ensure us to establish long term relationship with customer. HANIF FURNITURE has been manufacturing a full line of quality display showcases. Our clients come from a variety of industries including jewelry, watch gift, optical, government, museums, and schools. Our products are used in many different ways, from a promotional program, to a custom designed store, to a single showcase in a retail environment; our showcases suit the needs of corporations and small and big businesses.